Following the launch of 1.1.1.1, Cloudflare’s high-performance DNS, as well as the creation of a mobile app that enables iOS users to more easily make their mobile devices work through the service across both cellular and Wi-Fi connections, the firm believes it can improve connections through the service even more, especially for mobile users. While the current version of 1.1.1.1 does act as a Virtual Private Network (VPN) for the purposes of using Cloudflare for DNS purposes, the app does not actually function as a fully-fledged VPN, as only DNS queries are secured and optimized. Under Warp, the app does work as a VPN completely, affecting all of the device’s traffic by encrypting all unencrypted connections. As well as providing end-to-end encryption, the app will also offer faster browsing, by caching and compressing content automatically. The VPN is also said to be more resilient to changes in connectivity, namely from cellular to Wi-Fi or between Wi-Fi networks, or handling captive portals that typically exist in public Wi-Fi hotspots. While free VPNs are a sensitive topic for some people, such as those worried of ending up in a similar situation to Facebook or Google’s data-harvesting VPN apps, Cloudflare insists the free service is different. The company claims it doesn’t write user-identifiable log data to disk, never sells browsing data or allows advertising data to target users, does not require any user information to use the basic version of the service, and that it regularly hires outside auditors to check privacy is being upheld. Along with the free version, a paid tier called Warp+ will also be made available for a “low monthly fee.” The premium version will take advantage of Cloudflare’s virtual private backbone to offer even faster connections. 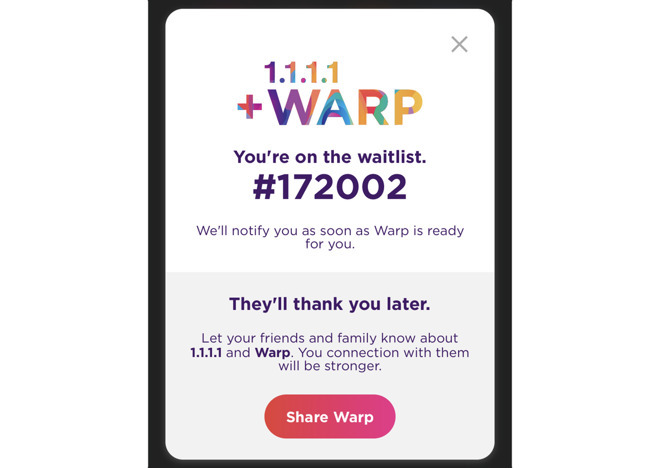 Cloudflare is slowly rolling out Warp to potential users via the existing 1.1.1.1 app starting within weeks, where those interested have to sign up to the waitlist to gain access. It is forecast that all those on the waitlist will be able to use Warp by the end of July.